Exclusive to Heal’s, Kyoto is a modern electroplated glass collection, showcasing 3 simple shapes - long, globe and wide. Each piece in the Kyoto collection is hand-blown in Poland and is finished with a metallic electroplated finish, creating a different effect when the light is on and off. When off the pendant has a contemporary mirrored effect and when on a stunning reflective surface effect. Kyoto lends itself to being used within large clusters when purchased alongside our Multiple pendant ceiling rose. Electroplated glass creates a different effect when the light is off. When off a contemporary mirrored effect is displayed, when on a stunning reflective surface can be seen. Handblown in Poland creating a unique look for each pendant. Premium glass pendant paired with a contemporary black pendant kit, for a modern, sleek look. The Kyoto collection has a metallic electroplated finish which will create a different effect when on and off. 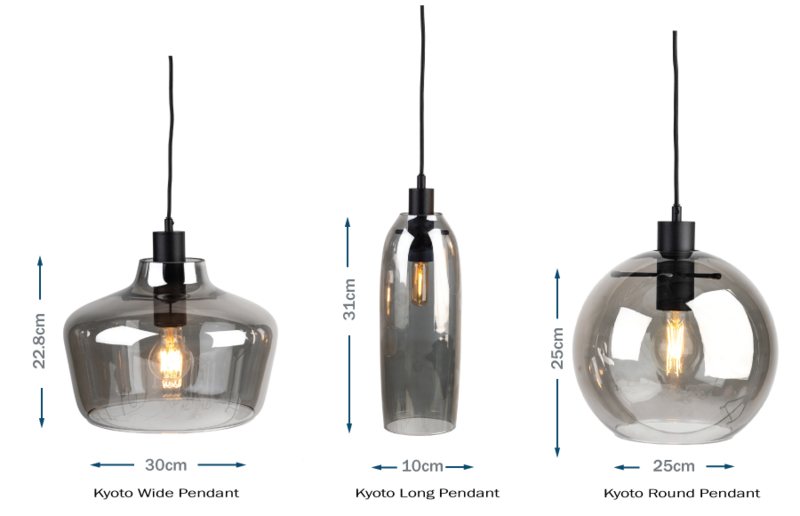 Wide & Round pendants require 1 x E27 bulb. Long pendant requires 1 x E14 bulb. Our Multiple pendant ceiling rose is the perfect accessory for creating your own modern chandelier.